A GAL NEEDS...: It's All InThe Coconut - Tropical Traditions Giveaway! It's All InThe Coconut - Tropical Traditions Giveaway! I am happy to announce that Tropical Traditions would like one of my readers to win a 1 quart jar of their Virgin Coconut Oil! A few posts back, I told you how I was introduced to the benefits of using virgin coconut oil, specifically Tropical Traditions. You read how impressed I was with the benefits of virgin coconut oil. But I am also particularly impressed with Tropical Tradition's immaculate product processing, their choice selection of only the finest coconuts from the Philippines, the great taste, and their customer bonus program called Healthy Buyers! You can read my post here or you can visit Tropical Traditions directly and watch the video about how they discovered Virgin Coconut Oil, you can go to their recipe blog, which gives you yummy and easy recipes that use coconut oil in them. Of course, Tropical Traditions has way more than just the Coconut Oil. They have so many products that are healthy and farm fresh, without harmful pesticides or hormones. I invite you to check out their many other quality produts. Get It: You can buy directly from Tropical Traditions website. There is a great sale for their Organic Coconut Peanut Butter, just $6.99 for 16 oz.! Or you can buy 2 of the Coconut Cream Concentrate and get 2 for free! And a 32 oz. jar of Tropical Traditions Virgin Coconut Oil is just $27.50! Tropical Traditions also has a Referral Program, so if you place an order with them as a first-time customer, please select “Referred by a friend” and in the box that says “How did you hear of us?” enter this sponsor ID # - 5954910. You will receive a complimentary copy of the book Virgin Coconut Oil: How it has changed people’s lives and how it can change yours! by Brian and Marianita Shilhavy with your first order! This book is filled with testimonies and research showing how healthy coconut oil is, and it also includes over 85 recipes showing how one can incorporate coconut into their diet. Win It: For a 1 quart jar of Tropical Traditions Virgin Coconut Oil, please complete the mandy (mandatory entry) and any of the following entries for extra chances to win! Please make your e-mail address available so I can contact you if you win!!! Mandy: Visit Tropical Traditions and pick your favorite recipe that uses coconut oil! Become a Facebook Fan of Tropical Traditions! Come back and leave your follower first name and last initial!Subscribe to AGalNeeds....RSS Feed (on right sidebar) using Google or another method that you prefer! Tweet daily for an extra entry every day! Leave me your twitter status in your comment! 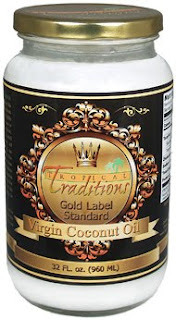 You can copy and paste this: "AGalNeeds...a jar of virgin coconut oil from @TropTraditions http://helena-agalneedsatleast2blogs.blogspot.com/ 4/10/10. Blog, Facebook or Stumble about this giveaway and leave the post link! If before April 4th, give yourself 3 extra entries (1 comment per entry). If after April 4th, give yourself 2 extra entries. Leave the post link where you did so! You may do all three if you'd like, for the appropriate entries for each one. This giveaway will end on 4/10/10 at 12:00 am MST. I am excited that one of you will get this wonderful gift! Thanks to Tropical Tradition for their help and generosity. Winner will be chosen with Random.org and will be notified by e-mail. Contest is open to both US and Canada. However, Tropical Traditions is not responsible for customs or duties that Canada may charge if you decide to participate in this Tropical Traditions sponsored blog giveaway! The opinions expressed in this blog are mine and were not influenced in any way by Tropical Traditions or any other outside party. The Coconut Cream Hot Chocolate Recipe sounds so yummy. Their recipe for coconut avocado chocolate pudding sounds very intriguing! Gotta love getting two different good-for-you oils in one sweet package! I like the sounds of the Chicken Curry recipe. Sounds yummy. i have made the brownies and they are delish! I think my family wouldn't know the difference! I found Tropical Coconut Oil on a blog for authors from Hachette Book Group (hgb.com) and am finding more coconut foods in the grocery store. The craze for coconut has begun. PS any recipe with chocolate has my name on it. I think their Dutch Baby sounds delicious! I'm signed up for the TT newsletter. I would like to make the chicken curry. oh the coconut hot chocolate sounds divine! and so easy to make I would love it! Easy coconut curry recipe sounds divine! My family would love the Roast Chicken with Coconut Oil Recipe. Thanks for the giveaway. I'd love to try the Coconut Chocolate No-bake Macaroons recipe and it uses 1/3 cup coconut oil.